This soup is a great way to stretch a pound of meat. 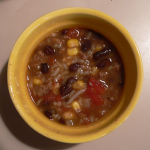 It is delicious served with cheddar or Daiya cheese, salsa, corn chips and sour cream if you can tolerate dairy. This makes a huge pot full. This recipe is easy to adapt to what you have on hand. 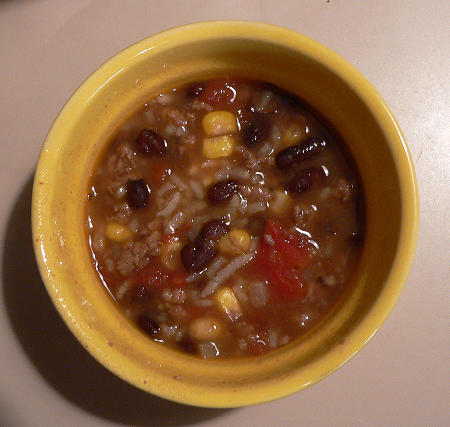 Adjust the corn and rice amounts to how thick you want your soup. 1. In a large saucepan, cook ground beef and onions. 4. Reduce heat and simmer 20-30 minutes. This post is part of Penny Wise Platter Thursday.